FAFDL community discussion of this article can be found here. This site has been taken down since, but the idea that salt, vinegar, and dish soap aren’t chemicals is not uncommon. Vinegar contains acetic acid, a chemical (yes, a chemical) with well-known herbicidal properties; it is commonly used by organic gardeners and farmers as a herbicide. The knowledge that salt (sodium chloride, usually) has herbicidal properties goes waaaayyyy back. Soap (even soap is a chemical) is added to increase the spreading of droplets on the weed leaf surface. Most commercial herbicides also contain soaps for this purpose, although we usually refer to them as “surfactants” in that context. The combination of acetic acid, salt, and soap will certainly kill many annual weeds, especially if applied when the weeds are small. The question I get most often about this homemade mixture is “how does it compare to commercial herbicides?” In particular, how does it compare to Roundup (the trade name for many glyphosate formulations)? This question is especially relevant since several websites tout the mixture as a safe and inexpensive alternative to glyphosate. Comparing the homemade mixture to glyphosate is difficult because the situation will often dictate which herbicide is the better choice. If you are trying to kill small, annual weeds, I would expect the homemade solution to be as effective as glyphosate. The vinegar + salt solution will probably burn the weeds down faster than glyphosate, but glyphosate would likely work slightly better over the long term, especially on large weeds. The glyphosate molecule is systemic, that is, it will travel throughout the plant (even down to the roots) to effectively kill all plant parts. The vinegar + salt solution, on the other hand, works on contact primarily by disrupting the integrity of the cell membranes and desiccating the plant. It will not travel long distances through the plant (say, from one leaf to another). So if you don’t get complete coverage of the plant leaves with the vinegar + salt solution, there is potential for the plant to re-grow from the living tissues. Coverage with glyphosate is less crucial since the herbicide molecule will travel to parts of the plant that were not sprayed. This difference between systemic and contact herbicides is very important in how to best use each product. Because glyphosate travels through the plant, it can control perennial weeds, such as Canada thistle and quackgrass. The vinegar + salt solution, since it doesn’t move throughout the plant, will not be effective on perennial weeds. It will burn off the top growth of perennials (which may be desirable), but it will not provide long-term control. The contact nature of the vinegar + salt mixture can be a benefit, though. If you need to kill weeds in close proximity to a desirable plant (say, killing chickweed in a flower bed), then glyphosate can be problematic. Only one or two stray drops from the glyphosate spray bottle onto a flower might be enough to kill the entire plant. A few stray drops of the vinegar + salt solution, on the other hand, will probably cause a little speckling but won’t kill the desirable plants. The exception would be if you continually spray salt in the same area, you can end up with too much salt in the soil, and that will damage nearly all plants. Acetic acid and glyphosate break down rather quickly in the soil, and so won’t cause any long-term soil problems. So there are certainly some scenarios where the homemade herbicide mixture might be preferable to glyphosate for practical reasons. Comparing effectiveness between the two herbicides is difficult; they both have a potential fit depending on the situation. But what about the “inexpensive” and “safe” claims? I did a little homework to see how the homemade herbicide mixture compares to glyphosate with respect to cost and toxicity. For costs, I went to Walmart and checked prices for vinegar, salt, and soap. It would cost approximately $3.31 to mix up one gallon of homemade herbicide, using prices from Walmart. This is using name-brand products available at most grocery stores; one could lower the price further by buying the Walmart branded products instead of name-brands. If I bought Walmart’s Great Value brands, the price would be reduced to $2.70/gallon. My local Walmart doesn’t sell a Roundup-branded product that contains only glyphosate; there were always other herbicides included ranging from triclopyr (for woody species and vine control) to diquat (for quick burndown) or i mazapic (for long-term residual control). But there were several products that contained only glyphosate. A half-gallon of Eliminator Weed & Grass Killer Concentrate was available for $27.97. At first glance, this seems much more expensive than the homemade mixture; however, to mix up 1 gallon of spray solution, you only need to add 1.5 fluid ounces of the concentrated product. At that rate, the cost of the glyphosate solution is only $0.66/gallon. The label states that for “Tough Weed Control” you can mix up to 2.5 fluid ounces per gallon, raising the cost to $1.09/gallon. Even then, glyphosate is actually less expensive than the homemade mixture on a per-gallon, ready-to-spray basis. For the toxicity comparison, I only looked up the mammalian toxicity values for glyphosate, acetic acid, and salt. Rat acute oral toxicity values and rabbit acute dermal toxicity values for all three chemicals are summarised in the following table. The toxicity values are presented in mg of material per kg of body weight of the test organism. The LD50 is the dose of the chemical that would kill 50% of the test population; in this case rats dosed orally or rabbits dosed on the skin. Low LD50 numbers mean higher toxicity. In both toxicity measures, acetic acid is more toxic than glyphosate. Salt is more toxic to rats compared to glyphosate when exposed orally. The dermal toxicity numbers are a little more difficult to interpret since for both glyphosate and salt, the values are listed as greater than a value. This typically means that the experimenters did not kill enough of the test rabbits at the highest doses used in the studies; so we know that glyphosate is safe at least up to 2,000 mg/kg and salt is safe at least up to 10,000 mg/kg. But we can determine from this data that acetic acid is more toxic than both glyphosate or salt. Pound per pound, glyphosate actually appears to be less acutely toxic to the mammalian test organisms compared to acetic acid or salt. But this is only half the story with respect to toxicity. To estimate the actual risk of these products, we need to know not only the toxicity but also the use rate; the dose makes the poison. Even highly toxic substances can be used safely if the dose is sufficiently low, and seemingly safe chemicals can be problematic if the dose is too high. To figure out the actual risk, we need to calculate the amount of the toxic substances being applied. Most distilled white vinegar is 5% acetic acid (50 grain). At this concentration, one gallon of the homemade mixture would contain 6.4 fluid ounces of acetic acid (the active ingredient). One gallon of acetic acid weighs 8.74 lbs; so 6.4 fluid ounces would weigh 0.437 lbs; so there is 0.44 lbs of acetic acid per gallon of homemade mixture. To convert this to similar units as the LD50 values, 0.44 lbs equals 198,220 mg. Eliminate Grass & Weed Killer contains 3.7 lbs of glyphosate acid per gallon; or 0.0289 lbs glyphosate acid per fluid ounce. At the higher labelled rate of 2.5 fluid ounces of product per gallon, there would be 0.07 lbs of glyphosate acid per gallon of mixed product. Similarly converting this to the same units as the LD50 values, 0.07 lbs equals 31,751.5 mg. So it appears that glyphosate, the less toxic chemical, is being applied at a rate 6-times lower compared to acetic acid. Let’s do one more calculation to put these toxicity numbers into perspective. Male rats can weigh up to 500 g, or 0.5 kg. One gallon of the homemade mixture contains 198,200 mg of acetic acid, or approximately enough to kill 59 rats, if administered orally. One gallon of mixed glyphosate solution contains 31,752 mg glyphosate, or enough to kill 6 rats. The acetic acid in the homemade mixture is nearly 10 times more lethal than the glyphosate in the Eliminate mixture. And this doesn’t include the salt. How could this be, you ask? Everything you’ve read on the internet says glyphosate is causing ailments from autism to obesity. How could glyphosate be less toxic than vinegar? 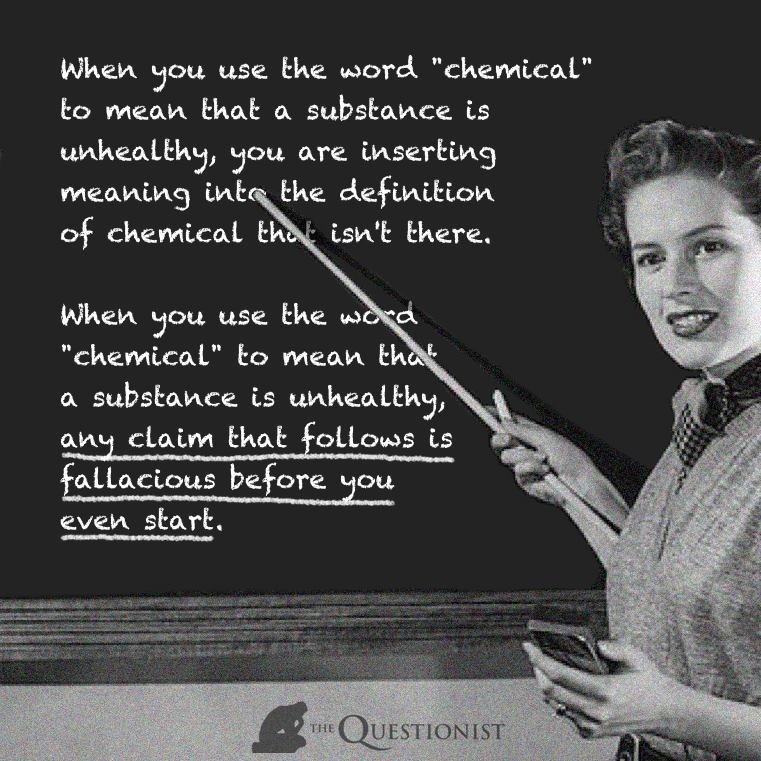 Truth is, it is easy to make a chemical (any chemical) sound pretty nasty, even if you use verifiable, factual information. For example, sodium chloride, one of the ingredients in the homemade herbicide solution, is mutagenic for mammalian somatic cells and bacteria. Another ingredient, acetic acid, is highly corrosive, can aggravate respiratory disorders, and even cause permanent vision loss. Does this sound like something you want to be spraying in the same yard where your children and pets play? Should you be dousing your yard with a potent chemical cocktail that causes mutations in humans and causes blindness? And now we learn that this chemical cocktail is nearly 10 times more lethal to mammals than glyphosate, one of the most potent weed killers on the planet! If you’re less scrupulous about your sources, you can even find links between acetic acid and a multitude of disorders, including eczema, psoriasis, shingles, and herpes. You read that right; THIS HOMEMADE HERBICIDE MIXTURE MIGHT GIVE YOU HERPES! Maybe you’re not worried about the safety aspect; you simply don’t want to purchase Roundup because you dislike Monsanto. Well, don’t forget that vinegar is often made from corn, and most corn in the US has the Roundup Ready trait (which was developed by Monsanto). So the vinegar you are using to spray your weeds is probably made from corn that was sprayed with glyphosate: the very herbicide you were trying to avoid. All joking aside, the important thing to keep in mind is that both the homemade vinegar + salt mixture and Roundup are pretty darn safe when used properly, they’re both relatively inexpensive, and both can provide effective weed control in the appropriate situation. Now, all this discussion has made me hungry for some Roundup Ready sweet corn, with just a little salt, and a salad with a nice vinaigrette dressing. Please consider supporting GMO Building Blocks with an ongoing contribution of $1, $2, $3, $5 or $10 a month on Patreon. 7-12 of 17 – Glyphosate in Wind, Rain; Down the Drain? 17 of 17 – Can Glyphosate Research Be Trusted? “Too educated” to see the idiocy of such comparisons in this context. This might express it better. Why? So much for freedom of speech. Censorship at its finest. No, censorship is different and is done by gov’t. This is blocking an abusive liar that sets up many fake accounts to flood a thread with his crap. Abusive liar? You cannot prove he has many fake accounts so why the accusations? Talk about liars. It has been proved by those I trust. Starting with Arthur. The very fact that you are defending this scum means you are either dumb as a rock or another fake account. No it hasn’t Eric. Who’s Arthur? You are such a liar. I have one account, how many do you have? Sage is a truth-teller. Funny how your description of him is exactly how you pro-GMO industry PR shills are. Pot meet kettle! The same semantic word play has been used with term “GMO,” and has been used to obfuscate differences between genetic engineering and selective breeding. (As in the false statement “We’ve been genetically modifying crops for thousands of years!” to imply that we have been genetically engineering crops for thousands of years. Clearly this kind of word play is intellectually dishonest, at best, and blatant propagation of misinformation at worst.